Two researchers at a time are allowed access to the Newaygo County vital records at the County Clerk office in White Cloud, MI., every day of the week during the hours of 8:00AM till 12:00PM, then 2:00PM till 5:00PM, except for Wednesdays when the office is closed to the general public. Birth and death records are listed from 1867 to the present, and only birth records greater than 100 years old are available for research to those other than heirs of the registrar. 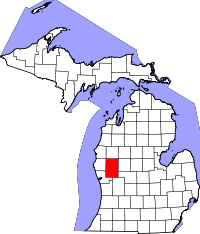 Marriage records begin in 1851, the same year Newaygo County was established, and continue to the present, along with divorce records which begin in 1854. The County Clerk provides birth, death, and marriage certificate request forms which can be filled out on user's computers, then printed and mailed in along with the $13 fee and any required documentation.